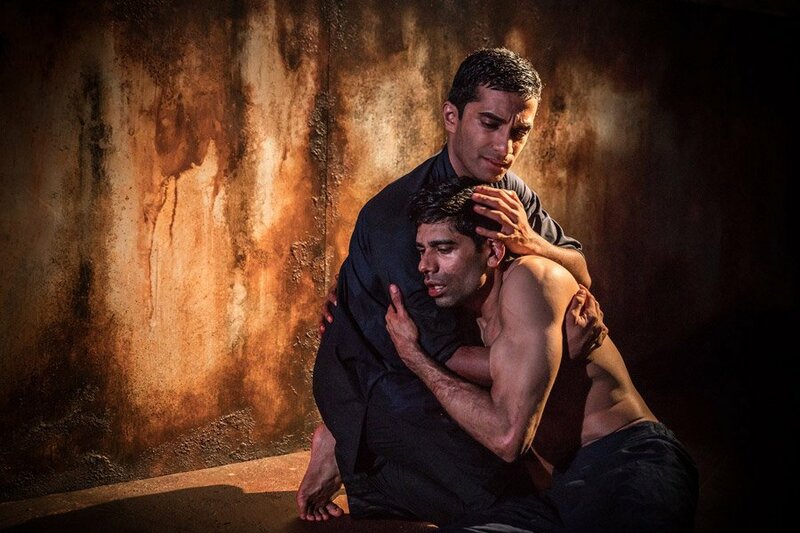 Darren Kuppan and Danny Ashok in Guards At The Taj. 1648, Agra, India. The emperor has decreed that no one, bar the labourers, shall look upon the newly built Taj Mahal until it is fully complete. This includes Humayan (Danny Ashok) and Babur (Darren Kuppan), two low-ranking imperial guards who have been landed with the dawn shift. Together they must stand looking away from this great architectural wonder. They mustn’t turn around. Best friends since they were young, they’re a mismatched pair – pragmatic, realistic Humayan’s father ranks high up in the imperial guard. Babur, an idealistic day-dreamer, spends his days thinking up outlandish inventions. Babur speaks highly of Ustad Isa, the architect of the Taj, but Humayan knows that a terrible punishment awaits the man, and it will be left to the lowest rank of the guard to carry it out. Danny Ashtok and Darren Kuppan in Guards At The Taj. So begins Rajiv Joseph’s smart two-hander, artfully directed by Jamie Lloyd who avoids unnecessary gimmick in favour of a clean and unfussy staging. It works very well, with Soutra Gilmour’s stark cell of a set allowing Joseph’s script to take centre stage. Joseph manages to create an entire world through the eyes and the words of these two men. The two guard’s matey banter gives them a grounded, everyman vibe, but the best moments are when this gives way, quite by surprise, to beautifully emotive and almost poetic language. These fleeting moments fully demonstrate Joseph’s talent as a writer, and he has created an intelligent and fully dimensional piece. It almost has a mythical quality to it, as if the audience is witnessing a fable; the men who killed beauty. Beauty is a topic returned to again and again with a deep and earnest reverence from Babur, and it is beauty that ultimately and unwittingly betrays him. 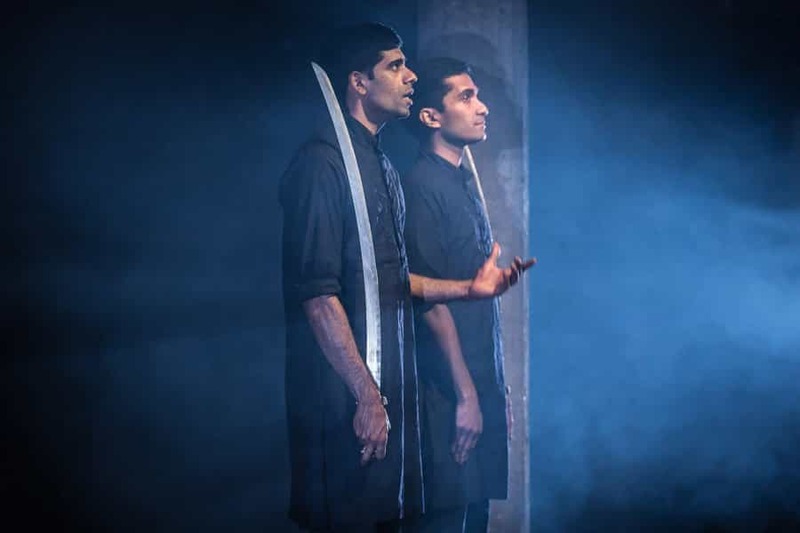 Left alone on stage, Ashok and Kuppan work wonderfully together as the two guards. Their conversation meanders with the easy openness that comes with close friendship. There’s a sense of a history between the two, suggesting a lifetime up to the point where we first meet them at the wall of the Taj. The loss of this friendship as the play develops is made all the more affecting by this initial closeness, and both actors create an absorbing performance. Kuppan excels in the opening scenes, where Babur can’t quite resist voicing every thought that crosses his mind. These mischievous interjections contrast all the more with the trauma he suffers at the play’s climax. Ashok, as Humayan, masters Joseph’s dialogue and delivers it with sublime confidence and regimented, economical swiftness. Humayan sees the world how it is, with all the restrictions the emperor’s rule places on him. Babur imagines how the world could be, strange places and unfamiliar people far beyond his limited experience. Under Agra’s strict rules there is no place for a dreamer like Babur, and as Guards at the Taj goes on, this slowly becomes horribly clear. The 80-minute running time flies by as the play takes the audience towards its brutal conclusion with no way of turning back. 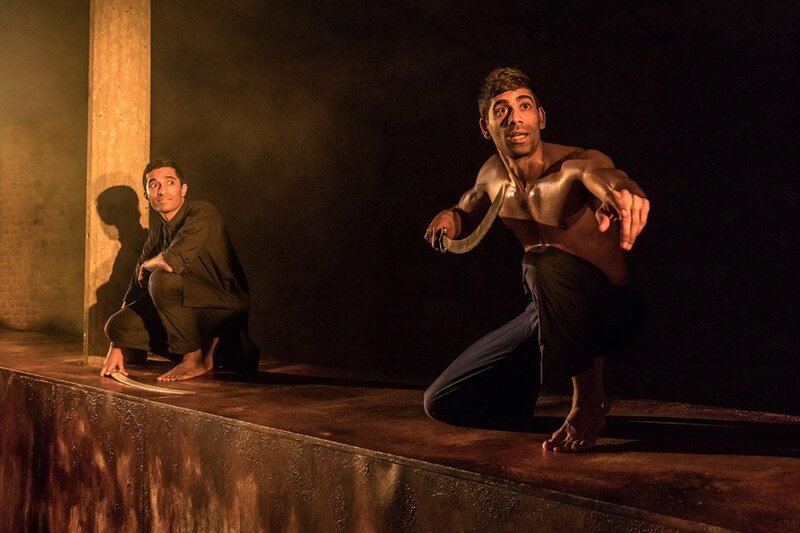 A deeply affecting story with moments of dark humour, Guards at the Taj is an excellent choice of a premiere for the newly renovated Bush Theatre.